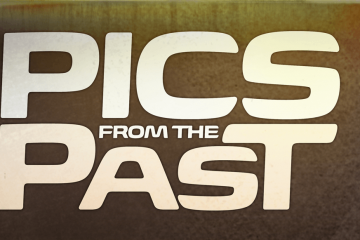 IN TODAY’S WORLD OF EVER-EXPANDING SOCIAL MEDIA CONNECTIONS, ONE SIMPLY HAS TO FIRE UP A COMPUTER OR SMART PHONE TO CHECK OUT JUST ABOUT ANY SUBJECT THAT’S BEEN DOCUMENTED ON THE INTERNET. It could be finding your favorite recipe for Southern barbeque, learning a new language, or it could be coming across some badass rides on Instagram and falling in love with a lifestyle. 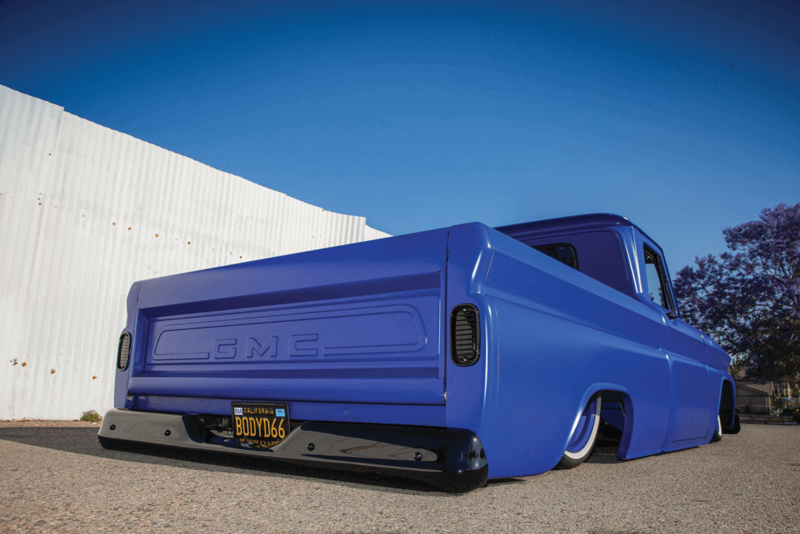 That’s how we came across Jason Sanchez’s bold-school ’66 GMC 1500 short-bed pickup dubbed The Blue Nightmare. 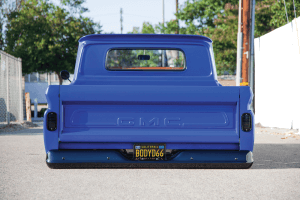 While checking out my IG (Instagram) feed I saw this killer GMC truck that was slammed, tucking wheels and sporting a unique blue paint scheme. After doing some cross-referencing on the StreetTrucks IG page and meeting a buddy of Jason’s on the ’Gram, it was just a matter of time before we would meet face-to-face early one Friday morning for a perfectly timed photo session. Once I arrived, I finally had the chance to meet Jason, his son and a good buddy of his. Once you get to see the GMC up close and in person, it’s even more impressive than its pictures on the net. 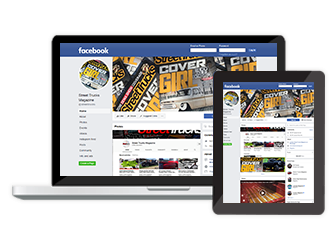 Jason originally found the truck online for a fair amount of money. “I found it on Craigslist in the Victorville, California-area. 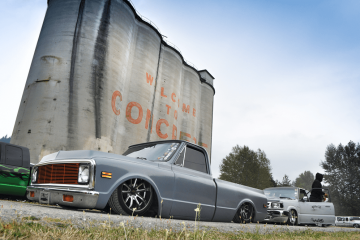 It was ugly, but it ran, and it had the original straight six-cylinder with the three-on-the tree shifter.” At first he didn’t know what he wanted to do with it, but then he started seeing all of these slammed mid-’60s C-10 trucks in person and online, so he decided to go that route; only his truck would be just as nice if not better than those that he used for his initial inspiration. Jason made sure to get all of his ducks in a row. He planned to focus first on all of the mechanical stuff. 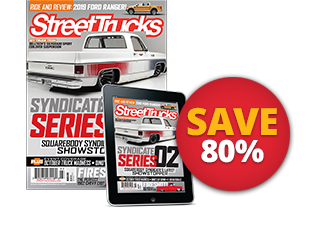 He sent the truck to SIK Fabrications in Riverside, California, where the GMC was completely dismantled and inspected. With the OG (original gangsta) chassis removed, a fresh new Choppin’ Block setup was fabricated for the front and rear frame rails. Jason, who is an electrician by trade, installed that great-looking air ride setup using an Air Lift Performance manifold and controls along with Firestone air springs and fittings. It’s one thing to have a truck built by professionals, but when you can get involved and take the lead on part of the build yourself, it makes things just a little more special. JASON, WHO IS AN ELECTRICIAN BY TRADE, INSTALLED THAT GREATLOOKING AIR RIDE SETUP USING AN AIR LIFT PERFORMANCE MANIFOLD AND CONTROLS ALONG WITH FIRESTONE AIR SPRINGS AND FITTINGS. While this was all going down, Jason decided to give his ride a few more contemporary horses. He ditched the tired and worn-out factory six-cylinder for a used but healthy 2002 LS1 short-block V-8. 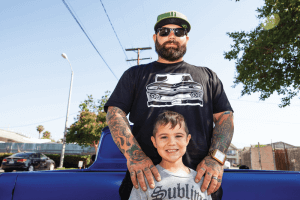 Engine builder Jorge “Junior” Conde, owner of Kustom Kreations in Rialto, California, handled the power plant upgrades before Jason bolted it to the chassis. Junior dropped a new TSP Velocity intake manifold into the 5.3L LS1, which is mated to a GM 4160e transmission. This combination sends the power all the way back to a 9-inch Currie rearend via custom three-piece driveshaft. 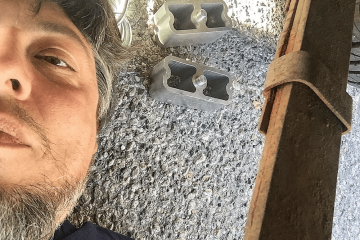 The spent fuel fumes rumble through a custom 3-inch Carven R exhaust system, and Jason even repurposed the OEM radiator and dual fans that are original to the LS1 engine. 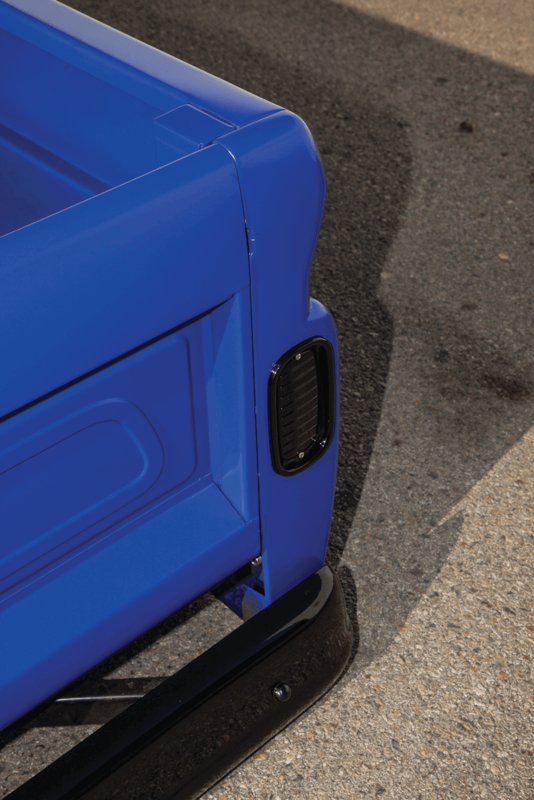 Inside the open-air bed sits a Switch fuel cell tucked safely between the chassis rails—smart man. 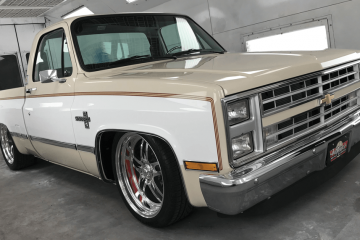 “Junior did all of the engine wiring, brakes, driveshaft and pretty much everything else from the rolling chassis to completion,” Jason added. JOSH FRANKLIN OF CAL AUTOWORX IN RIVERSIDE, CALIFORNIA, GETS PROPS FOR THE GMC’S OUTSTANDING FIT AND FINISH. HE TACKLED THE BODYWORK BEFORE PAINTING IT NIGHTMARE BLUE SATIN. TASTEFUL GRAPHICS WERE ADDED BY ARTIST LARRY SMUDGES OF TEMECULA, CALIFORNIA. A QUARTET OF 22X9-INCH COLOR-MATCHED MOBSTEEL ARTILLERIES FROM DETROIT STEEL WHEEL, WEARING 265/35R22 DIAMOND BACK FX FEDERAL TIRES, TUCK NICELY IN THE WHEEL WELLS. Since this was definitely going to be a driver, Jason made sure his braking setup would be up to par with the increased engine dynamics. A set of CPP disc brakes, front and rear, are plumbed to a Wilwood master cylinder, and Lokar pedals transfer stopping commands to the brake system. 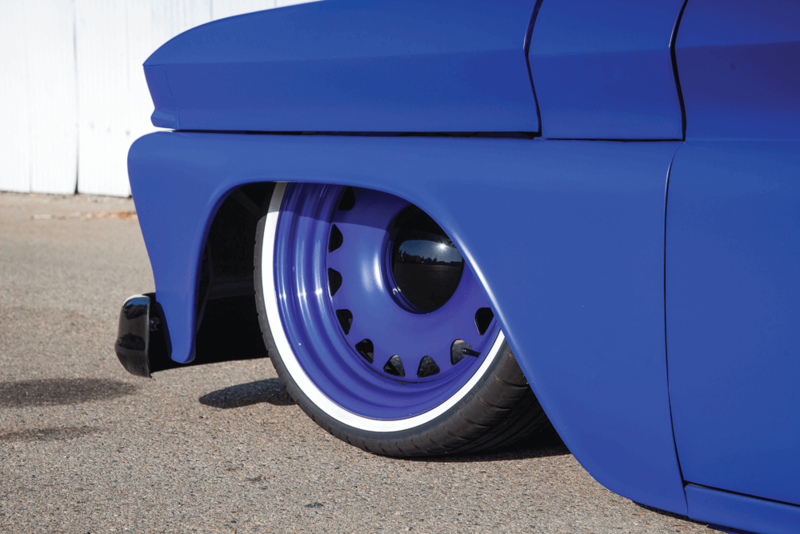 A quartet of 22×9-inch color-matched Mobsteel Artilleries from Detroit Steel Wheel, wearing 265/35R22 Diamond Back FX Federal tires, tuck nicely in the wheel wells when Jason slams Blue Nightmare to a killer stance. THE OEM RADIATOR WAS ADAPTED TO THE 2002 LS1 SHORT-BLOCK V-8 FOR A CUSTOM LOOK AND FIT. BUILT BY JORGE “JUNIOR” CONDE OF KUSTOM KREATIONS IN RIALTO, CALIFORNIA, JUNIOR DROPPED A NEW TSP VELOCITY INTAKE MANIFOLD INTO THE 5.3L LS1 AND MATED IT TO A GM 4160E TRANSMISSION. 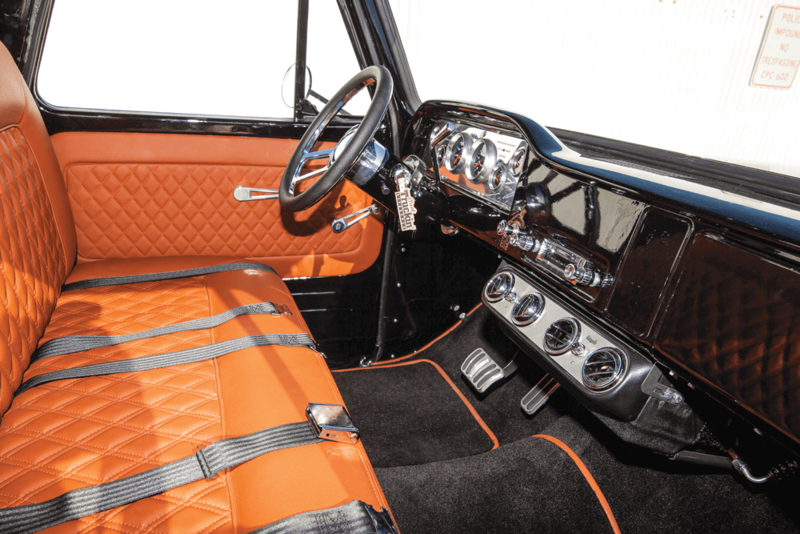 Inside the cab you’ll find fine stitching by Junior’s Custom Upholstery by Reza, located in Lake Elsinore, California. Johnny Reza Jr. covered the OG seating in pecan-colored leatherette with a double-stitched pattern. He created matching door panels and installed the custom-made contrasting black carpet kit. The door panels sport new cranks and handles from Brothers Truck Parts, and a set of Auto Meter Cobalt series gauges sit tight in the polished dash cluster. Vintage Air helps keep drives comfortable with cool, clean air even on the hottest days. 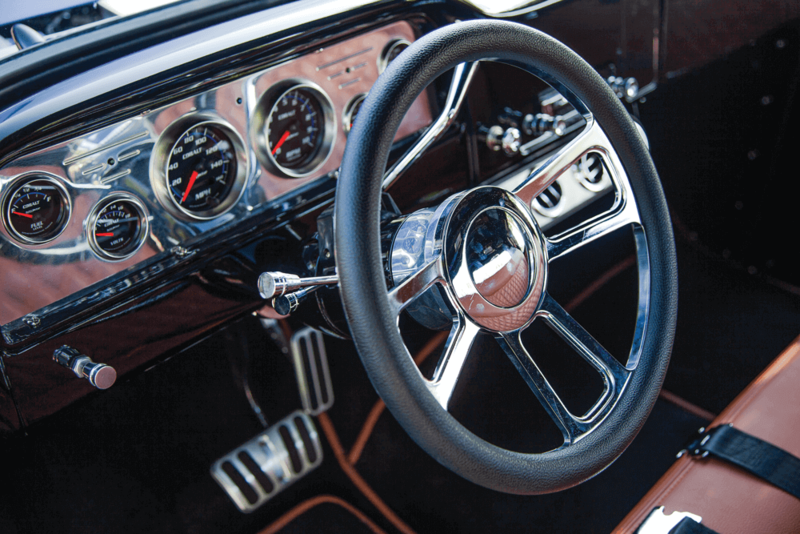 Tunes are filtered through a RetroSound unit installed by Junior, and a Speedway T-style steering wheel sits atop the color-matched CPP steering column. Josh Franklin of Cal Autoworx in Riverside, California, gets props for the GMC’s outstanding fit and finish. 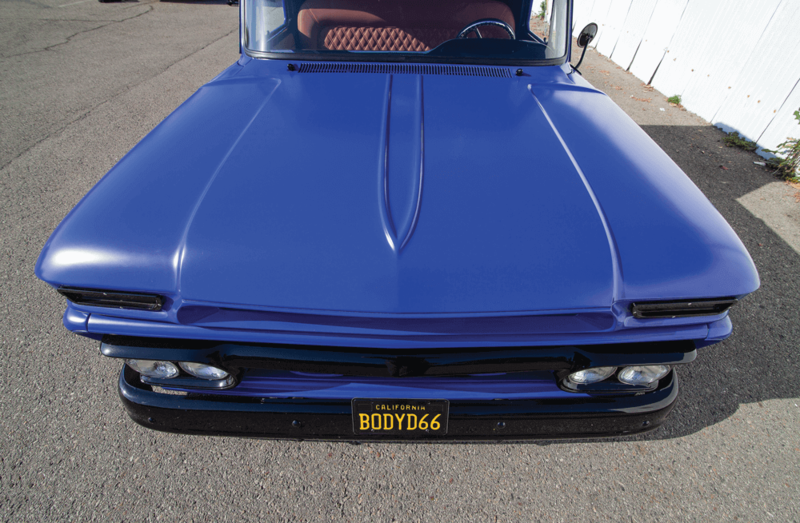 He tackled the bodywork before painting it Nightmare Blue satin, and tasteful graphics were added by artist Larry Smudges of Temecula, California. Finally, some slick glasswork was installed by the guys over at Rialto Auto Glass. JUNIOR’S CUSTOM UPHOLSTERY BY REZA, LOCATED IN LAKE ELSINORE, CALIFORNIA, COVERED THE OG SEATING IN PECAN-COLORED LEATHERETTE WITH A DOUBLE-STITCHED PATTERN. After all was said and done, it took only a brief 10 months to get Jason’s GMC truck to where it is today. Most custom builders only dream of finishing a fantasy ride in such a short time. Jason is thankful for all of the people involved, especially his wife Kristin for allowing him to build his badass GMC. Previous ArticleSTREETTRUCKS TOON OF THE WEEK!